If you count March, we still have another month of winter ahead of us. Whomp whomp. On the bright side, we are still testing lotions at HQ! 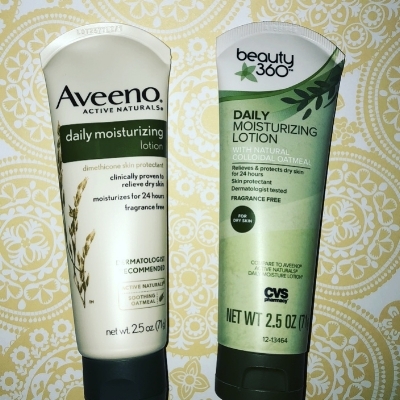 We found another great dupe for Aveeno moisturizing lotion. The CVS beauty 360 version scored a 92% similarity score. Brandefy compares store brands (i.e., beauty 360) to name brands (i.e., Aveeno) to reveal when the generic is as good as the name brand, and to warn you when it is not. Our purpose is to help you save time and money, and to have a good time while doing it. Your wallet should be leathery (and fat if you shop smart! ), but your hands should not. That's why we will continue testing lotions as much as possible. We have a great copycat from CVS. The beauty 360 version of Aveeno daily moisturizing lotions does an excellent job mimicking smell and after effects. The active ingredient panels are 98% similar, and the inactive ingredient panels are 90% similar across our scoring process. The one difference we noticed was consistency. The Aveeno was thicker, and less soupy than the CVS version. This was a slight enough difference that it did not bother us, but should be noted if you are big on consistency. We are off to find more lotions to test. What are some of your generic favorites?